Of course, they knew they’d be missing for part, and it turned out all, their best player and a former league MVP, Derrick Rose. But then they had the regulars in their top nine rotation miss more than 100 games with injuries. And Luol Deng and Kirk Hinrich, starters all season, then missed most of the playoffs with injury and illness. Still, the Bulls played the defending champion and favored Miami Heat tough, losing in the same five games they did when they were mostly healthy in the 2011 playoffs. Though there were disappointing defeats all regular season, like to Charlotte, New Orleans, Phoenix, Cleveland and Sacramento, the thrills far outweighed the frustration. There were so many brilliant moments of delight and joy, like breaking the Heat’s 27-game winning streak and then completing a season sweep of the Knicks and ending their 13-game winning streak. There were fabulous individual moments, like Marco Belinelli’s three game winning shots or Joakim Noah diving out of bounds to save a ball to set up one of those shots. Noah and Deng were All-Stars, and Noah had brilliant games, like a rare triple double with blocks and a game of 30 points and 23 rebounds, recording historical markers. Jimmy Butler was discovered and immediately began battle with Deng for league ironman status that extended through the playoffs with five games of 48 minutes. Nate Robinson, a last addition, became an energizer and favorite, bailing the Bulls out of numerous games with his exciting individual play. Deng beat Toronto with a game winner reminiscent of Michael Jordan in Utah in 1998 and the team overwhelmed Kobe and Howard in the United Center. Robinson beats the Nets with a floater and Nazr Mohammed saves it with a block. Carlos Boozer is fifth in the league and second in the East in double/doubles, the Bulls dominate the Heat in Miami and perhaps the most exciting play, Noah’s tip in against Denver, is waved off on a night Robinson had 35 points. And then there was the triple overtime playoff win over the Nets with Robinson’s fourth quarter fireworks and the seventh game win in Brooklyn, the first ever for the franchise on the road. And then the opening victory in Miami and an end that wasn’t decided until the last seconds as the Bulls with half their top six out pushed Miami to the limit. The prospects look bright, frankly, considering coach Tom Thibodeau signed a contract extension and Rose should return fully healthy next fall. Deng, Boozer, Butler, Taj Gibson, Hinrich, Noah, Rose and Marquis Teague all remain under contract. Richard Hamilton has a buyout. The Bulls will get the No. 20 pick in the 2013 draft. Good health isn’t promised to anyone. But with Rose’s return, the maturation of Deng and Noah and how competitive the Bulls were against all the top teams in the Eastern Conference in the regular season and playoffs, it would seem likely without much, or any, change the team will be in position to compete for the conference championship next season. Derrick Rose: The team’s undisputed star ended up missing all season with the recovery from his ACL surgery last May. There was criticism directed toward Rose that he should have tried to play. But Rose remains the future of the team. Without him and at full health or close, it seems unlikely the Bulls could be considered serious title contenders in any season. He plans to work out in Los Angeles in the offseason as well as probably some high altitude training for conditioning and is expected to be fully ready to open the next season. Joakim Noah: He had one of his best all around seasons, averaging 11.9 points and 11.1 rebounds and made first team all-defense and the All-Star team. But his plantar fasciitis returned late in the season, costing him a dozen games. It seemed to miraculously disappear in the playoffs, but its potential return hangs over him and the team. 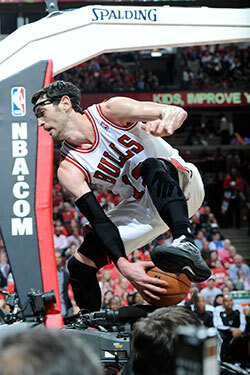 His hard play reflected the Bulls’ defensive identity as he’s become one of the league’s top centers. Luol Deng: The Bulls second All-Star belies the case the Bulls need another star. They had two players selected as All-Stars by the coaches. Deng led the team in scoring and the league in average minutes played as the “glue,” according to Thibodeau. His bad reaction to a spinal tap procedure cost him the last seven playoff games. His name will come up most in trade rumors since he’s good, and he is going into the final season of his contract. If the Bulls plan to try free agency again in 2014, they couldn’t resign him at a high salary. But he’s only 28 and one of the league’s best defenders. With one year left on his deal, the Bulls likely could not get much given he might only be a rental for another team. Plus, with Rose’s return the Bulls have to be considered serious title contenders and Deng’s ability to guard stars like Carmelo Anthony and LeBron James is crucial to the Bulls’ defense, which doesn’t rely on double teaming. The assumption is he returns and this group gets one more chance with Rose. Carlos Boozer: The oft maligned (by fans) power forward had his best season as a Bull with 44 double/doubles and led the team in scoring and rebounding (tied with Noah) in the playoffs. There’s always speculation about amnesty, which the Bulls don’t plan to do. It makes no sense as even if you were to amnesty Boozer the team still wouldn’t be under the salary cap to be in free agency. And Boozer was second to Deng in scoring, almost averaged a double/double with 9.8 rebounds per game and led the team in scoring a team high 25 times. There is no substitute for his offensive production and he was a reliable player starting 79 games, most on the team. He’ll return. Kirk Hinrich: The popular former Baby Bull from the early 2000’s returned and played a vital all around role despite missing 22 games with injuries and the last eight in the playoffs. He was signed to be a one-year emergency starter for Rose and then able to play both with Rose and back up at point guard. The presumption is with fewer minutes as a third guard the injuries will be less frequent. Though he didn’t shoot well, Boozer’s best season was much attributed both to Boozer’s better conditioning and Hinrich’s playmaking. Plus, Hinrich’s perimeter defense was among the best in the league even if too often unrecognized in the voting for all-defense. Taj Gibson: The backup power forward signed a four-year extension, but had an injury plagued season with MCL sprains. Gibson mostly played through them, averaging eight points and 5.3 rebounds in 22 minutes, but 6.5 points in the playoffs. His lack of developing into a scorer basically erases any thought the Bulls would part with Boozer. But his ability to guard smaller players is one of the keys to the Bulls defense and he’ll remain a high level defensive reserve. Nate Robinson: Probably the surprise player of the season, maybe in the whole league. He was signed to an unguaranteed minimum contract which only was fully accepted in January. But he emerged as a vital shot maker without Rose. He was third on the team in scoring at 13.1 per game, second overall in scoring in the playoffs, a tenth of a point behind Boozer, and second in the Miami series. Though sometimes an erratic defender, he even emerged as a motivational force with his relentless scoring and fearless demeanor. He was one of the biggest offseason acquisitions. But his emerging profile will probably put him out of the Bulls price range, especially with the return of Rose. That would leave little time for Robinson with Hinrich moving to backup. Robinson will likely get a guaranteed offer and move on like John Lucas did last summer. He is not expected to be with the Bulls next season. Marco Belinelli: Another big offseason acquisition, the veteran shooting guard led the team in game winners and no matter how much he played (27 starts in 73 games) and how he was shooting he always was ready for a big shot. He became one of the team’s better pick and roll players and a distributor when he’d play alongside Robinson. He was third on the team in threes attempted and second in the playoffs. Retaining him will be complicated. The Bulls are one of six teams in the NBA in the luxury tax, which under the new agreement has a multiplier as you go over the tax to add players. The problem is with the core players of Rose, Deng, Noah, Boozer, Butler, Hinrich and Gibson the Bulls are into the luxury tax already. Not only whatever they spend to add players above that adds to their tax, but prevents them from sign and trade deals and likely the ability to add players after next season if the Bulls still cannot succeed. Say they want to retain Belinelli, who would be good for an all around backcourt, though he’d likely be a reserve. Given his season, he’d likely get a multiple year offer somewhere. He liked Chicago and the Bulls and might want to stay. But matching a multiple year offer could prevent the Bulls even if they did amnesty Boozer in 2014 and not bring back Deng from going after a free agent. So would it be worth retaining a reserve for 2013-14 and then not being able to pursue a so called max free agent in 2014? Not that any might be available, anyway. It’s the big question for management. Obviously, Belinelli would help for next season. But do you mortgage the future for a reserve? It’s one of the tough decisions coming in the offseason. My guess is he gets an offer too big to match, though the question will remain open into July. Jimmy Butler: The find of the season after the 30th pick in the 2011 draft rarely played last season. But with injuries to Deng during the season and then in the playoffs, Butler emerged as a strong all around player who should be a front runner for Most Improved next season. Though the notion was he played small forward, he shot well enough and defended well enough to be a shooting guard. He should be the starter next season. With Butler, Deng and Hinrich, the Bulls can put out the strongest perimeter defensive unit in the league. Then you add Noah and Gibson and you have five potential all-league defenders on the court at the same time. Butler certainly surprised me as I saw him as a top sixth man. He answers a long need for a shooting guard and leaves the Bulls primary needs as backups. Richard Hamilton: He was worth the investment even if injuries limited his effectiveness both seasons. There was some controversy about Hamilton not playing in the playoffs given the injuries, and he did provide scoring. But Thibodeau prefers defensive players and that left out Hamilton much of the time. He handled himself with class and professionalism and deserves to remain in the league and should be able to help a veteran team if his health holds out. He was brought in to be the playoff shooting guard, but Butler’s emergence changed that dynamic. He has a buyout estimated at about $1 million, which is expected the Bulls will exercise if he isn’t included in some sort of deal at draft time. He is not expected to be with the team next season but has been a true pro who helped the younger players like Butler and especially Robinson. Hamilton’s presence was no small factor in eliminating some of the distraction with Robinson that left him without a team coming into this season. Marquis Teague: It was rookie hazing for Teague, which with the Bulls generally means not playing. He rarely did, but he showed signs of productivity when he did play. He’s quick, an offensive point guard who can beat guys to the basket. He tried extra hard to listen to the coach and move the ball, so rarely was as aggressive as he could be. But he has to begin to play, which also limits the chances of a Robinson return. He should fit in well as a fourth guard for emergency situations. 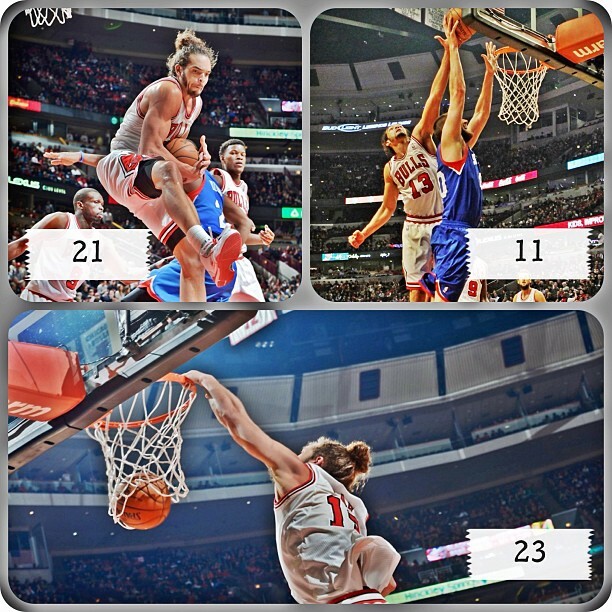 Likely, Rose will not play as many minutes and Hinrich has been injury prone. So there should be more time for him to fit in. Nazr Mohammed: Perhaps he’ll most be remembered for throwing down LeBron James. But he came on strong late in the season and in the playoffs as a reliable veteran backup center in something of the Kurt Thomas mold. He is probably not a big minutes player, but he can fill a bench role like Brian Scalabrine did — though without the histrionics — as a strong teammate who can sit out multiple games and then come in and perform and also be a good teammate and veteran voice. Given he is a Chicago native and does considerable charity work in the community, he likely would want to stay and I can see him back as a 12th or 13th man on the bench and third string center. Perhaps the Bulls biggest offseason need is a regular, younger backup big man they may get through the draft or perhaps with a veteran. Vladimir Radmanovic: He rarely played and never quite filled that role of a stretch forward. But he always was a good and positive teammate, engaged on the bench and supportive. He likely will not return and have a difficult time finding another NBA team. Daequan Cook: He was a mid season pickup after starting the season with the Rockets. The Bulls took a look given his reputation as a shooter and having won a three-point shooting contest in 2009. But he didn’t shoot the ball particularly well for the Bulls and was one of 10 overall in the playoffs. A former first round draft pick, he likely won’t return and his NBA career could be in question. Malcolm Thomas: A fan favorite from summer league, and there’s always one, he was signed late after playing overseas and in the D-league. He’s a poor man’s Taj Gibson, a smallish, hustling power forward. Given the Bulls should have several roster spots open again after losing part or much of the bench again, he could stick as a young, defensive reserve who is an active rebounder.